I noticed that the signals from a DUT didn't seem as large as I remembered, so I tested. 1) Yellow probe against cal. port. Result: very weak (low voltage) waveform, badly distorted. Adjusting probe does nothing. Blue probe changes nothing. 2) Multimeter check CH1 input: Open. 3) Multimeter check CH2 input: 1.00 MOhm. When turning on CH2, small temporary jump to 1.05 MOhm or so. 4) All other inputs work like CH2. 5) Then I realized that I don't hear any clicks when I turn on CH1! 6) The relay that clicks when going from the 2V to 5V range seems to work, but the clicks sound different than the same clicks on CH2-4. I can't imagine that a self-cal could have broken the input section, could it? edit: I broke the input section. The self-calibration will PASS with a blown input section. See below for actual details. Re: Rigol 1054z CH1 input relay (control?) dead... after self-calibration? Maybe, but possibly a mechanical failure. Self Cal cycles through channels and input settings, most of which use relays for the various ranges. But looking at the schematic, there's no back EMF diodes across those relays, maybe they're inbuilt ? A DMM should show if there's power to those relays, so a quick check for you to try. Did you try rerunning the self cal? Maybe it left the eeprom in a less than ideal state. In fact, two nights, the first self-cal failed. Then, when I ran the self-cal again, it passed. Now it passes, and the relay for CH1 is not turned on or off during the test. Self Cal run when hot or cold ? Whenever something like this happens to me I am always suspicious of firmware/eeprom content and look for a way to completely "recover" the device (back to factory state) - be it reinstalling the firmware, finding the "clear all memory" or something like that. While a bad relay (or a driver transistor) is always possible - the fact that it worked prior to the calibration makes it entirely possible that something bad was written that prevents the relay from clicking. I think that repeatedly pressing the 5th darker gray soft button on the left (not counting the top "menu" button) while powering on resets the scope. It doesn't seem like a complete wipe (as the installed option remain). I tried this, and it certainly reset lots of options. But it did not change the behavior of CH1, unfortunately. 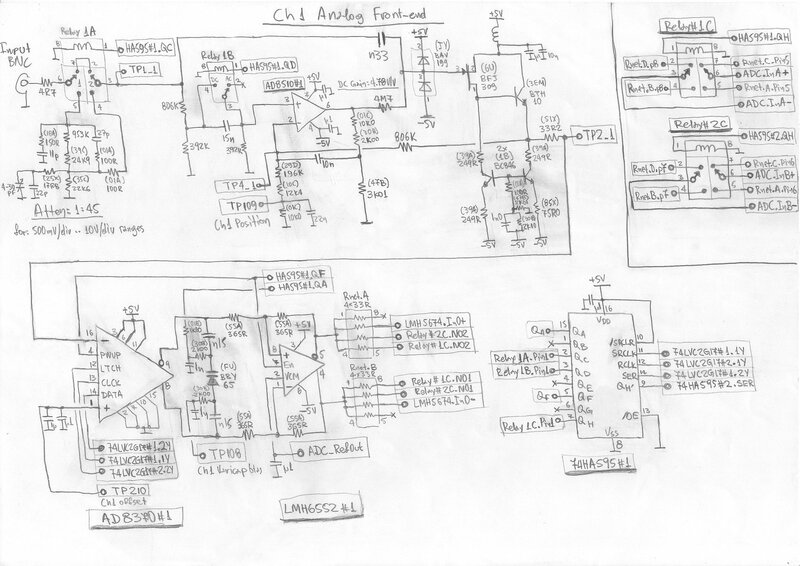 Follow a DC coupling path in the schematic to the opamp, is there ~800K ? The Teardown (pt2: DAMAGE DONE). In damage-01, the traces (from input to a 75R, to square pad, to relay) appear in-tact but they are not. In damage-02, you can see the debris from the 75R resistor "fanning out" between a input ground pad and the square grounding pad. In repair-01: For the repair, I simply bypassed the curved ground-shielded trace there; it was ripped halfway out. The pads for the resistors were also heated off. I used some 30 AWG silicon multistranded wire I had laying around. I glued the wire and the resistor down in place (with glue stick glue... ugh!). In possible-remaining-damage-01: I noticed that, at some angles, this trace from signal pad to relay looks damaged too. However, since I have tested the scope's input as pictured and have found no errors, flaws, or extra noise (up to about 10 MHz for fast signals, 300 MHz for sinusoidal ones)... I am just going to leave that as-is. Note: this is clearly not a good enough fix in general. The original trace was embedded in a ground plane, and this is not. I suppose you could have used some very small coax cable (like what's used with SMA) and grounded the outside shield. But for higher bandwidth and noisy signals, it's more and more important that the grounding fill on either side of the trace is exactly as designed. Can you tell us more about what caused the fault? I thought this scope was rated to 300V RMS. 60V p-p is just over 20V RMS and so shouldn't be distantly close to damaging the scope. I've been following this thread and also entirely baffled. I believe that rating only applies when you are using the scope probe. I hooked up a portable (hand-held) marine radio directly to the scope using a BNC cable and hit transmit. I think the output power was something like 6 watts. I assume I was at a low attenuation/input setting. It might have been +/- 60V, not RMS. I just typed the title from memory. Keep in mind that the input impedance of this scope is 1MOhm only; it has no 50Ohm option. So your 6W transmitter fired its signal more or less against a open end. Not sure how the transmitter operates under such wrongly terminated conditions and what voltages apply on the nearly open end of a transmission line. Obviously the voltages are enough to fry the input stage. To measure such signals make sure the transmitter is correctly terminated. If not you might not even see how the signal will look like if a correctly adjusted antenna is connected. And this termination resistor needs to be able to handle the applied power. If not other stated the rated values are usually the values of the bare input. Maximum voltage for steady-state sinusoidal waveforms, derate at 20 dB/decade above 200 kHz to 13 Vpk at 3 MHz and above. Something similar applies to 10x or 100x high-impedance probes. The probe manual will often have a maximum voltage vs frequency plot. So I imagine that 60 Vpk at some RF frequency would be very far beyond its rated specs. Well, I would be surprised if you didn't also blow your radio. If it was operating into an unterminated/high impedance load, that has likely generated few hundreds of volts there ... I do wonder how did you come to the conclusion that this is a good idea? Hey now, I never came to the conclusion it was a good idea. I had the device in front of me, and had the thought: I'd like to see what this waveform looks like, and then boom. I actually remember: I saw a waveform, and then a few seconds later it became a lot smaller, so I had to turn up the sensitivity; and then the waveform looked distorted. I bet this was because the input was blown, but it was still just resonating and coupling through the input section. Don't do these stupid things to your scope. If you have a low enough bandwidth scope, you can actually repair it. Even a shoddy repair can work. I think you have likely blown the output power amplifier of your radio too. janoc: I actually knew it was a bad idea at the time, I just was tired and not thinking. Just a genuine accident. I also didn't hook it up to my spectrum analyzer. As for the radio being blown, I'm not yet sure. It was a handheld radio where the antenna is easily removable so I suspect (and hope) it has some kind of output protection. Eep! That would have been a very expensive mistake. It might have, but if I was you, I would test it before you go sailing with it. The radio could appear to work just fine - except that nobody will hear you if the PA is blown. The rating better apply to the oscilloscope input itself without any probe or Rigol is lying in their specifications again. I do not have *any* oscilloscope which is not rated to 400 volts peak on every high impedance input and they will absolutely survive being directly connected to a 240VAC power line with a length of wire. Ok, this is a completely different situation. The input voltage rating at the BNC connector is derated with frequency just like a probe is derated with frequency. 25 watts into 50 ohms is about 35 volts RMS or 50 volts peak but at 150 MHz, the maximum rated input voltage is more like 12.5 volts peak and probably less for the Rigol. Without a proper termination, the peak voltage from the VHF transmitter could have been doubled. You are lucky more serious damage was not done. I totally agree. Especially because I can't afford another scope. I was going to have to live with a 3-channel jobbie.